When going through a divorce, one of the last things a person wants is to be sitting across a conference table from their spouse discussing their personal issues in the presence of attorneys. This can be especially uncomfortable and intimidating for people who are victims of domestic violence, harassment, threats, and other forms of abuse. Also known as a four-way conference, it involves couples sitting down face-to-face in a conference room with their attorneys to negotiate the different aspects of the divorce. A four-way meeting is most beneficial for spouses who are willing to collaborate with one another to reach an agreed settlement. Resolution of the divorce through agreement by the parties can save significant time, cost, and stress. What are your goals? What you do expect to achieve from the meeting? Schedule a consultation with your attorney before the meeting and let them know your concerns and goals. Ask your attorney to walk you through the process including not only discussing your priorities, but also the areas where you can be flexible. Make sure that your attorney knows everything you want addressed at the meeting so that they are not caught by surprise or unprepared on issues that may arise during the meeting. Lastly, let your attorney know whether you will actively participate in negotiations or whether you would like your attorney to speak solely on your behalf during the meeting. During the meeting, it is often tempting for couples to jump into the conversation and make accusatory or sarcastic comments to the other spouse. Such comments tend to derail all parties involved from the true purpose of the meeting. Try to concentrate on the bigger picture and keep any pent up anger or resentment at bay. This way, it is much easier to achieve the intended goals and convince the other party that you want to reach an amicable solution that is in everyone’s best interests. While it is essential that you don’t let the other party pressure you into agreeing to terms that you are not comfortable with, you should try to be willing to compromise when it leads to beneficial solutions. For example, you may want to settle on a lesser amount of maintenance in exchange for more child support in order to reduce federal and state tax consequences. By being flexible and focusing on solutions that are beneficial to both parties, it becomes much easier to reach common ground on small and big issues. Settlement reduces the expense and emotional distress involved during prosecution of the divorce. If you are going through a divorce, it is often a good idea to try to negotiate and settle matters outside court through a four-way meeting. 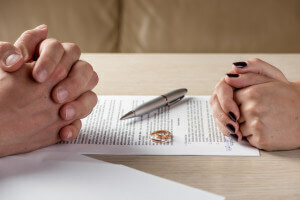 Contact a Naperville divorce attorney today to discuss your options. Our DuPage County attorneys have over 25 years of experience, and can help you with your divorce. Contact Keller Legal Services today at 630-868-3093 for a free initial consultation.